Gyoza is a family tradition that started with my Father from the time he spent in Japan. When I was growing up he cooked it nearly every weekend and definitely when guests visited. It was always the accompaniment to Japanese curry and fried rice. So when we had Charlotte, I knew this classic family dish would have to be adjusted so that she could enjoy it with us. 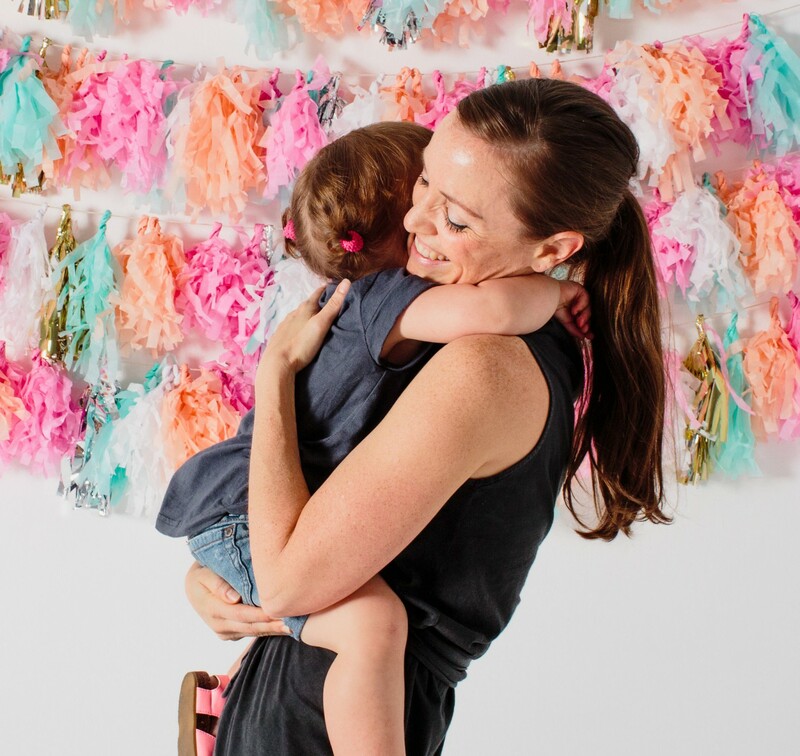 I have developed 2 separate recipes in this blog post with the whole family in mind: the traditional pork Gyoza and a vegan option. Neither are gluten free by the way. I have not found a Gyoza skin that is gluten free. (If anyone finds one, let me know.) The vegan option is fairly low in protein; as long as you don’t eat a whole plate of them. As the preparation and cooking are the same with both recipes, this is a good way of cooking for the family. Just be careful not to mix the dumplings. By the way, you might notice that for this cook, I’ve used savoy cabbage in place of Chinese cabbage. I had a huge head of cabbage in the house and this was a good use of it. 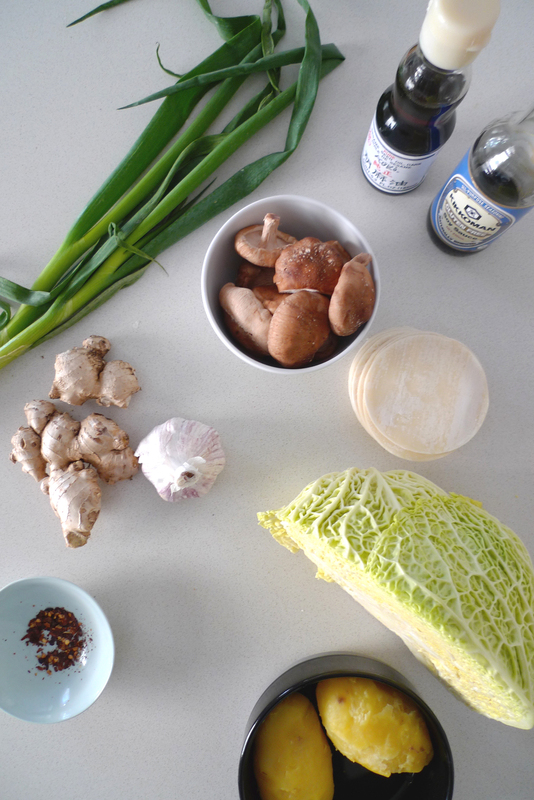 Either will work, but true Gyoza uses Chinese nappa cabbage. 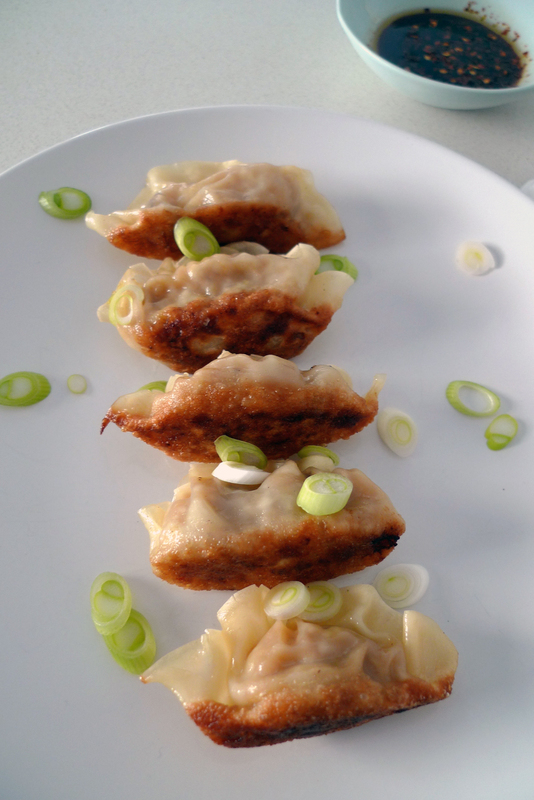 You can freeze the Gyoza before or after cooking them for easy snacks later. (That is if there are any left overs; unlikely). When making the Gyoza, I had more skins than mixture. With the left-overs, I baked them in small bread pans and made Japanese-style meatloaf. So good. Toss the cabbage in a colander with 2 teaspoons of salt and leave to drain for 15 minutes. Squeeze the salted cabbage to drain excess liquid. If using dried shiitake mushrooms; soak in hot water until soft and then dice. Boil the potatoes, cool then mash. Combine cabbage, potatoes, mushrooms and the remaining ingredients (except for the skins) in a large bowl and mix well with your hands or a spoon combine. Mix well so every ingredient is fully combined. Place in the fridge for at least 30 minutes to enrich the flavours (can be left overnight). To assemble the Gyoza, have everything ready to go! The room temperature Gyoza skins, the filling, a baking tray or board lined with baking paper so they don’t stick, and also a small bowl of water to help seal the Gyoza. 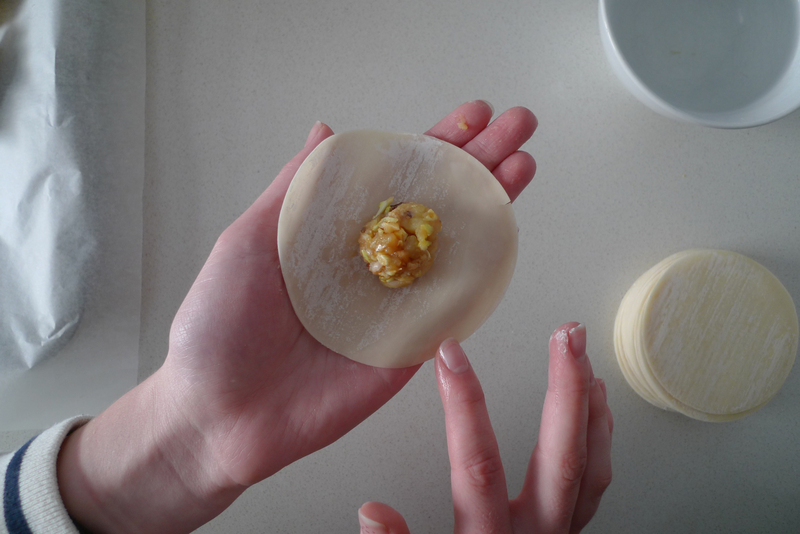 Place a single skin in one hand and spoon a heaped teaspoon of filling into the centre of the Gyoza skin. With your finger wet the edges with a little water and then fold over the skin to encase the filling. Pinch the skin in the center to seal the edges together at that spot. Holding the filled half-circle in your hand, pleat the top of the wrapper from the middle out, pressing it to the flat edge of the wrapper at the back. 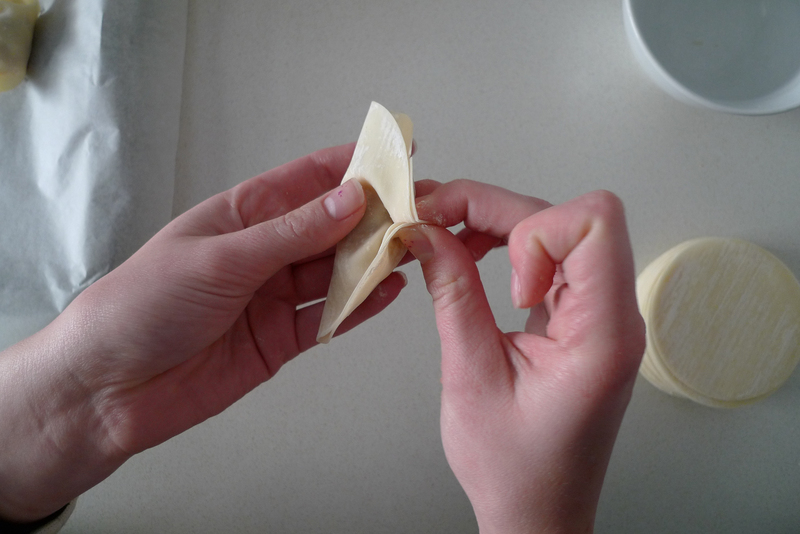 Set aside the stuffed Gyoza with the pleated-wrapper edge up. Repeat with the remaining filling. In a large, heavy based fry pan, heat the oil over a med-high heat, then add the Gyoza in a single layer, fairly tightly packed and flat side down. Press slightly down to ensure a flat surface. Cook until crispy and golden on the base of the Gyoza (approx. 3 minutes). Add 1/4 cup of water to the base of the pan and immediately cover to steam the Gyoza. 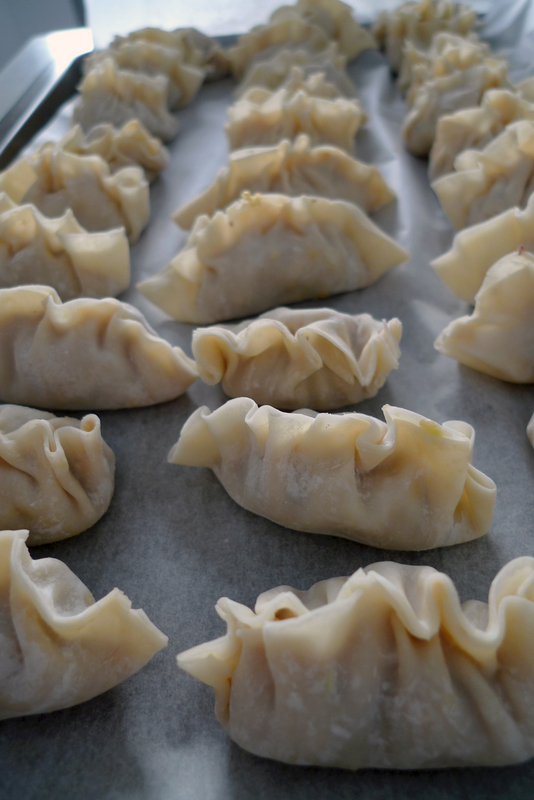 Cook until the liquid has completely evaporated and the Gyoza are cooked through. (approximately 4-5 minutes). Be careful when adding the water as it will bubble and spit as soon as it hits the hot oil. 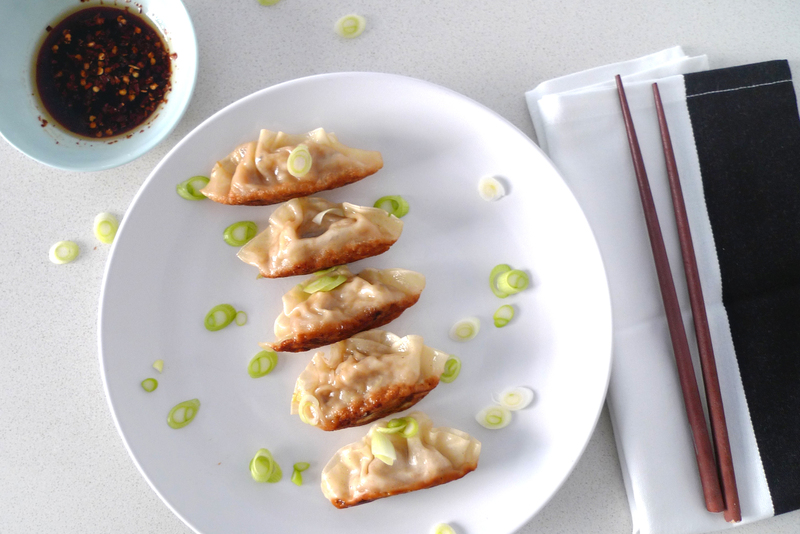 Serve Gyoza hot with the dipping sauce. For the dipping sauce, pour the tamari or soy sauce and sesame oil into a small bowl and mix to combine. Add chili flakes and set aside. Note: The amounts given are for one serve, so if serving two or three people, just double or triple the recipe. – To reduce the protein count further, reduce the amount of potatoes or use only the shiitake mushrooms as the filler. You can also use a variety of mushrooms in place of the potatoes. As per Vegan Gyoza ingredients. As per Vegan Gyoza procedure, with the pork in place of the potatoes.